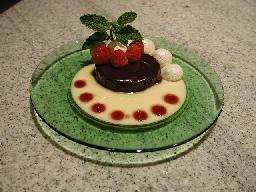 Large poaches meringue, filled with chocolate mousse and surrounded with Creme Anglaise and fresh Berries. A beautiful presentation. Golden Delicious Apples, as well as other good baking varieties like Rome Beauty, are a natural choice here. With butter, dark rum, apple juice, brown sugar, egg yolks, whipping cream, fresh ginger, flour, lemon peel, toasted almonds and dates. A triple layer treat. Incorporates flour, baking soda, cinnamon, nutmeg, cloves, currants, walnuts, sugar, butter, brandy, vanilla and egg yolks. The Frosting is butter, dark brown sugar, cream cheese, maple syrup and more walnuts. Beautiful unusual presentation with bananas, golden brown sugar, graham cracker crumbs, walnuts, pecans, eggs, wonton wrappers, presented on a Vanilla Custard with traces of Raspberry. White chocolate and milk chocolate fillings and a bittersweet chocolate frosting give a sophisticated spin to this favorite dessert. Lemon curd, a classic London teatime treat, and whipping cream are layered between crispy squares of sugared phyllo dough. Amsterdam, a small city with a big sweet tooth, provides the inspiration for these truffles. They have a double dose of mint in the form of fresh mint leaves and Vandermint, a Dutch chocolate-mint liqueur. A definite Holiday Dessert. Traditional French Yule Log cake, it is accented with a rich chocolate-raspberry icing and two fillings: white chocolate espresso cream and raspberry preserves. A Classic Holiday dessert. Very impressive layered dessert, made in a clear glass bowl, with liquor-soaked sponge cake, rich custard, fruit and preserves. A real summer winner (all seasons really! ). Served with vanilla ice cream, a crust made with flour, oats, milk, vanilla and butter, topped with sweetened Peaches and Berries. This is a Blue Ribbon winner. A yellow cake layered with hard chocolate discs and a cocoa frosting, topped with chocolate curls. 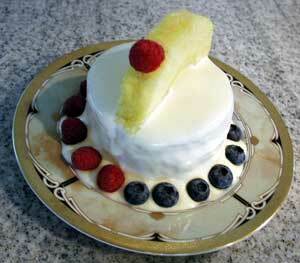 An exceptional cheesecake filled with the taste of pineapple, lemon and Rum flavoring. Topped with a mixture of butter, flaked coconut, chopped almonds and sugar. A very elegant ending, great with vanilla ice cream. Filled with a mixture of light corn syrup, sugar, orange marmalade, butter, light brown sugar, raisins, cinnamon and of course flambee with brandy. Another favorite. With eggs, butter, lemon cake mix, sugar, baking powder, salt, grated lemon peel and lemon juice. The cake incorporates sugar, vegetable oil, cinnamon, allspice, salt, canned pumpkin, baking soda, baking powder, eggs, flour, dates, raisins and chopped nuts. The sauce is made with butter, sugar, egg, heavy cream and Bourbon. This has to be the best Brownie Square recipe, very moist and tasty. A beautiful Tart topped with circles of raspberries and blueberries with mixed tastes of almond paste and lemon. This incredibly moist five layer cake is made with blanched Almonds, flour, eggs, sugar, unsweetened crushed pineapple, rum Sabayon and heavy cream. Tender Banana Cake, Cream Cheese Frosting and Mango Curd stack up to one impressive dessert. 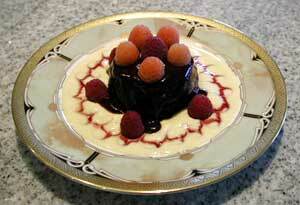 A crowd pleasing dessert that pairs creamy orange custard with tart Blackberry Puree. An eye pleasing light dessert. The Pears are roasted in a syrup made with butter, Hazelnuts, Frangelico, fresh lemon juice and Vanilla. With Key Lime Custard and Tropical Fruits the Phyllo Wafers are slanted on the Plate making this dessert a stunning presentation. A beautiful presentation of Bosc Pears cut in half, pinwheel shape with sugar and cinnamon. A western twist on the old fashioned pecan pie. Walnuts, dates and brandy give this pie its candy bar flavor. A great holiday dessert with cinnamon, allspice, ginger and whipping cream. Pears and walnuts make ideal partners in this delicate, old fashioned dessert which includes the sauce, the cake and the topping. 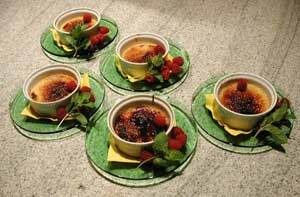 This dessert provides a southwestern twist, prickly pear jelly is paired with raspberries for the sauce, also orange liqueur. An elegant finale to a meal; the cake has a light texture, and the filling provides great pumpkin flavor with a hint of orange. Served warm with a Brandy spiked Caramel sauce and topped with roasted pecans. Raisins are optional. 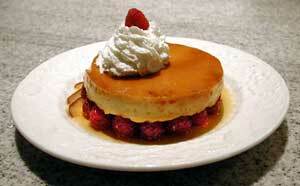 The cream cheese makes this flan extraordinarily rich and creamy. An Italian flavored dessert with a slightly sweet crust and a filling made with ricotta cheese, sugar, eggs, raisins, flour and grated lemon peel. 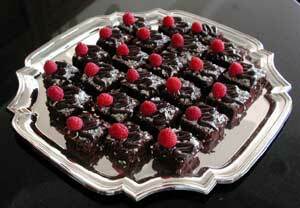 In this recipe dense chocolate cake is topped with a glaze made from raspberry jam and chocolate. Fresh berries are the finishing touch. Very elegant dessert. Beautiful pie with a sweet tart filling and a sensational crust. Also has brown sugar and dark rum. Comprises of a meringue layer, rhubarb puree, whipped cream, raspberries, once again and topped with a final layer of meringues. A graham cracker shell, hot caramel with melted chocolate, topped with thin sliced bananas and whipped cream. Another delicious eye stopper, little tarts with yogurt and sliced bananas brulee, surrounded with berries. This tart is served with a custard sauce and a ring of strawberries. This dessert makes a beautiful presentation, the ring being a lemon-lime mousse with the mixed berries and mangoes in the middle, surrounded with garnish made of lemon-lime peel twists and mint. Layers of toffee studded, coffee flavored mousse and chocolate ganache fill an almond and sugar cookie crust. Little tartlets made with an almond crust, tangy lemon filling and topped with strawberries. A three layer cake that makes a sensational finale to any meal. This filling of coconut, banana and cream is sweet, chewy and absolutely delicious. Coconut is also in the cookie like crust. You would never guess that this rich cake is low fat made with unsweetened applesauce. This is The Classic Cake that people rave about, with a slightly sweetened whipped cream frosting. 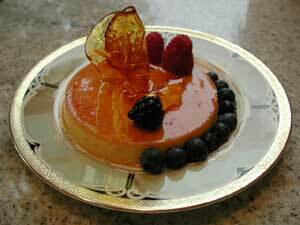 A new twist of a creme caramel with a slightly sweet light crust and strawberries. In this very pretty dessert, a buttermilk-based lemon custard fills the spiral of a light sponge cake roll. Fruit-such as kiwi, orange, pineapple and berries-garnish this cake with also pureed berries and a side of chocolate sorbet which can be store bought or made with your ice cream machine (such as Krupps). Hazelnuts are teamed with strawberries and rhubarb in this rustic tart. Vanilla Ice Cream is a must for serving! Phyllo Dough gives this dessert a crisp texture that contrasts nicely with the smooth lemon filling and of course strawberries. Topped with brown sugar, sugar, cinnamon and chopped nuts. Another original. 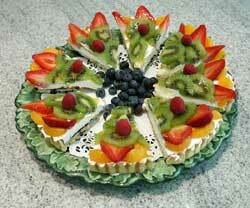 The ring is filled with fruits and also can be used as... a salad when filled with as an example chicken salad. 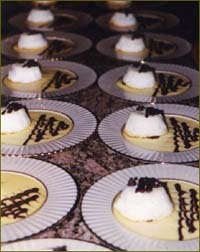 Another poached pear also with white wine, vanilla bean and dark rum or brandy. Also excellent, from a good Chef friend of mine that has since moved... With double cream, milk, eggs, vanilla, sugar, french baguette and an apricot glaze. Another great Holiday or any day dessert! Too good to be true... well it is! also has yogurt and whipping cream. While the meringue topping of this pretty tart is light, the lemon, orange and lime custard filling has an appealing richness. A cardamom and orange scented syrup is spooned over warm pears and vanilla ice cream in this lovely dessert. Named after a town in the Vaucluse and the sweet fortified wine produced there. Has lemon peel , orange peel, vanilla, Muscat wine and red seedless grapes. A great tart with fresh lemon juice, creme fraiche, butter sugar and eggs. 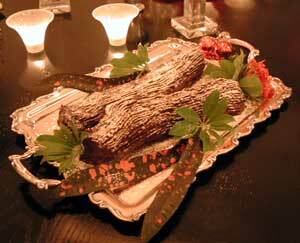 A twist on the regular buche de Noel with an orange filling and chocolate ganache. A delicious cake with cinnamon, ginger, cloves, all spice, vanilla, butter, light molasses and Bosc Pears. Whipped Cream optional! With the flavors of orange juice and Grand Marnier. A great looking, great tasting pie. Brown sugar enhances the crust. With a graham cracker crust and pine nuts and topped with whipped cream and fresh lime slices. This cake keeps well. The crumble is a middle layer of pecans, brown sugar and cocoa. Ice cream flavor of your choice, Vanilla sounds good! Honey instead of sugar gives it a different flavor. Very popular dessert during the Holidays. Pumpkin adds beautiful color to this cheesecake while Pecan Praline makes it a Southern-style topping. The crust also has sugar cookies and the topping yellow cormeal. A different approach to the chocolate mousse. With the flavors of whipped cream, pumpkin, vanilla, cinnamon, nutmeg, allspice and ground cloves. A Pecan sugar shell with a filling made of lemon zest, whipping cream, eggs, mascarpone and sugar. A lemony raspberry sauce tops the tarts. Delicious dessert specially when served with Ice Cream.